….so what is going on with all of these? Can you use Algebra to show why they work? We could start with a little mind reading – try Regifting Robin (turn the sound on). Try with several different starting numbers. 2. Add the result to your original number. 3. Divide by your original number. 5. Subtract your original number. Multiply any two digit number by 11. Can you prove this result? Solutions soon if you are puzzled. For when you want a method to factorise quadratics…. You can use the Desmos graphing calculator to support your study and understanding of functions. Using function notation you can enter composite functions as shown in the next two illustrations. Selecting each image will take you to the relevant Desmos graph page. For further exploration of composite functions check the pages in this slideshow. You can also easily explore transformations of graphs with Desmos. Use the excellent Desmos graphing calculator to explore the gradient of a straight line. Select the image then you can change the sliders for m and c to change the line and drag the points so you can verify the gradient of the line. See also Explore Straight Lines. To solve a quadratic inequality such as x2-6x+8>0 the best approach is to find the critical values of x which make the value of the function 0 and sketch the graph. Here we can factorise so we see that we require (x-2)(x-4)>0 We are looking for values of x to make x2-6x+8 positive. We see that y is positive when x>4 and when x<2. Note the link to another Desmos page where you can look at further quadratic functions. If you wish to see some worked examples and try some exercises you could check The Maths Teacher – See Algebra AS Level – Inequalities: Linear and Quadratic. Note the choice of video / transcript or go straight to the exercise with worked solutions. You may find other useful resources here too. You could of course use WolframAlpha to check the solution to any inequalities and generate as many examples as you want. Simply type in the inequality and plot as well as the he solutions will be returned. 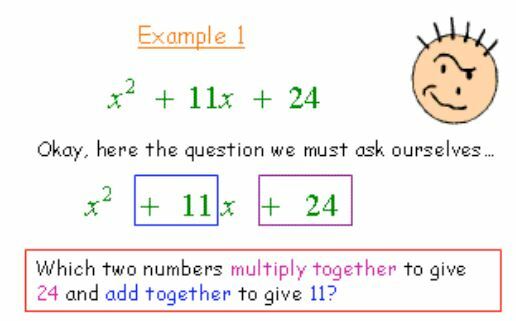 A collection of resources for you to learn and practise algebraic fractions. For a basic explanation see Mathisfun and note the questions to try at the end of that page. The University of Hull Mathematics notes seem very clear, in the Algebra section we have clear notes and exercises with answers on Algebraic Fractons. The notes and exercises include adding, subtracting, multiplying and dividing algebraic fractions. Algebraic manipulation from Just the Maths includes a section (1.5.4) on Algebraic fractions. The mathcentre has a section on simplifying algebraic fractions. On the subject of algebra generally, the mathcentre has a very useful refresher booklet. ..a basic skill any student of Mathematics needs. The following resources will help you practise solving equations. For a tutorial on simple equations, these notes from Plymouth University are clear; see also Section 3 of the Helm Project on equations. Both of these resources include examples, exercises and answers. From the Maths Centre, there are several resources on equations. Or try AJ Hobson’s Just the Maths (individual pdfs hosted by UEA) (or a complete pdf from the Math Centre: AJ Hobson’s ‘Just the Maths’) where you will find clear notes, examples and exercises on many Mathematics topics including Algebra. Remember you can use WolframAlpha to check your solution to any equation, see for example this link which checks the equation 2x+7=11. (Checking just the answers is free). To learn more about using WolframAlpha to check your work see the slideshows here. Experiment with these inequalities on the Desmos graphing calculator. For further Desmos examples see Explore Straight Lines and Explore Graphs. More examples on the Desmos Graphing calculator are available on the Explore Graphs page. @Desmos on Twitter have provided this wonderful example of art work which uses inequalities.